Turn patios and other paved areas into colorful garden-like areas. 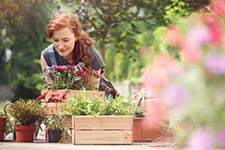 Learn to grow healthy plants by finding out about plant selection, watering and fertilization. Also, discover how to address plant care concerns before they become a problem.